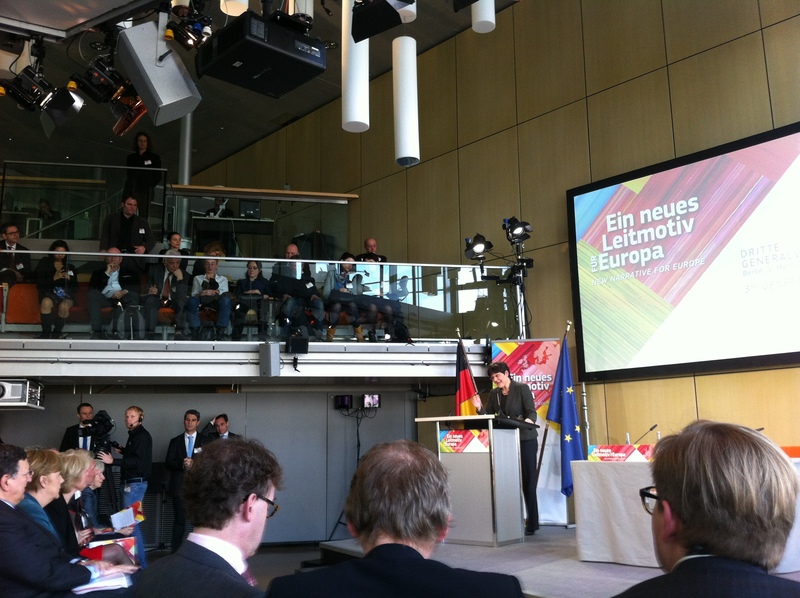 Artists, scientists and intellectuals presented the Declaration on the ‘New Narrative for Europe’, in the presence of President Barroso and Chancellor Merkel, at the Akademie der Künste in Berlin on 1 March. The reading of the Declaration was followed by inspiring speeches made by the President of the European Commission and the German Chancellor. As member of the Cultural Committee for the ‘New Narrative for Europe’, Europa Nostra’s Secretary General Sneška Quaedvlieg-Mihailović was the master of ceremonies. The event was completed by an artistic performance showing the link between culture and the European project. As member of the Cultural Committee for the ‘New Narrative for Europe’, Europa Nostra’s Secretary General was the master of ceremonies. “Europe is a state of mind formed and fostered by its spiritual, philosophical, artistic and scientific inheritance, and driven by the lessons of history. It must also now become a genuine and effective political body that has the ability and sensibility to rise to all the challenges and difficulties that European citizens are facing today and will face tomorrow. From youth unemployment to climate change, from immigration to data security, the list is long, and the urgency is even greater,” reads the Declaration. “Europe needs a societal paradigm shift – in fact, nothing short of a ‘New Renaissance’. Without disregarding the significance of economic and financial legislation, an urgent re-alignment of emphasis within the European political body is needed and Europe must acknowledge that culture is a major source of nourishment and supply for Europe’s social and political body,” it is claimed. “Europe as a political body needs the sciences – natural, technical and social – to find innovative responses to the intensity and extent of energy use. (…) Europe as a political body needs the arts to generate new and radical forms of imagination that will educate its sensibility. (…) Europe as a political body needs to recognise the value of cultural heritage, both tangible and intangible. Cultural heritage reveals what it has meant to be a European throughout time. It is a powerful instrument that provides a sense of belonging amongst and between European citizens,” it is argued. “To trigger this potential, Europe as a political body needs to develop a new cosmopolitanism for its citizens that includes dynamic and creative urban environments and healthy competition between cities. European cities should strive to become capitals of culture, increasing the quality of life of all Europeans,” it is advocated. “The Mind and Body of Europe is our response to the call of the European Parliament and of the President of the European Commission to draft a new narrative for Europe for all citizens. This document is not a point of arrival. Rather it is a catalyst that we hope will trigger more contributions to the debate,” it is stated. In his speech, the President of the European Commission, José Manuel Barroso, thanked all members of the Cultural Committee for their invaluable contribution to the ‘New Narrative for Europe’, promoted the role played by culture and called for an increased engagement of European citizens in the building of an ever closer Union. “Today the “raison d’être” of our Union is also the same that was there sixty years ago: peace, democracy, to be freed from fears, mistrust and divisions, to share security, stability and prosperity. But why do we speak about a new narrative? I believe that while keeping those values that were at the origin of the European integration immediately after the war, there is a new narrative, it is Europe in the globalisation. Europe is indispensable for us as countries and citizens to be able to defend our interests and promote our values in this world. We Europeans together, we have the necessary clout and critical mass to play a leadership role with our partners in shaping globalisation,” stated President Barroso. “I believe that our European culture offers an ideal platform for responding successfully to the challenges of the 21st century. I think the future of Europe will be knowledge, art and science. I think these are very important contributions that our vision of the world can give also to some universal values”, he added. “I know it is very fashionable to be intellectually negative about Europe. This is why I think we need the voice of artists, creators and scientists like you to come out of the comfort zone and to win the ideological battle about Europe. Recognising honestly all the shortcomings, criticising what has to be criticised but at the same time having the courage to speak for Europe”, advocated the President of the European Commission. “Your declaration unveiled today is your act of faith in Europe. You are here to show that we – the politicians, the intellectuals and, first and foremost, the citizens – hold our future in our hands and that we should all participate. Your declaration does not say that our Europe is perfect. But it says that Europe is our future”, he concluded. The New Narrative for Europe is a project proposed by the European Parliament and implemented by the European Commission following the call issued by President Barroso in his 2012 State of the Union Address. After the launch event in Brussels (23 April 2013) and two general assemblies held in Warsaw (11 July 2013) and Milan (8-9 December 2013), the 3rd and final general assembly taking place in Berlin marked the completion of the first stage of the New Narrative project.